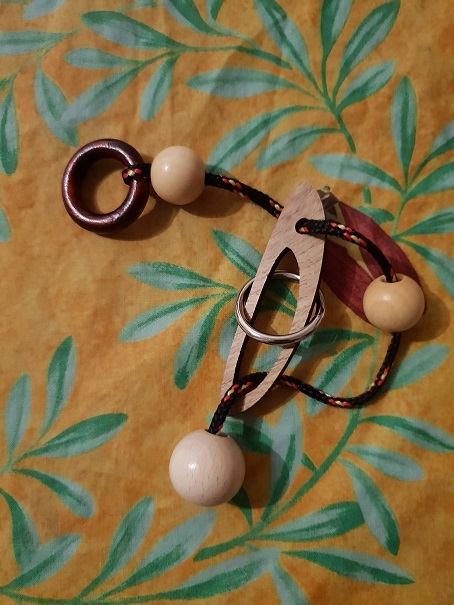 I bought this puzzle at a local market and the vendor could not tell me, what kind of solution this has. Is the ring supposed to come off completely? And does anyone know the name / solution to this? One name for this type of puzzle is a "Disentanglement puzzle" as described by Wikipedia here. There is an enormous variety of this type of string puzzle. The metal ring should come off completely. It looks as though it will not pass over or through the wood or leather (?) ring at one end, but the white ball at the other end should pass through it. Slide the metal ring down and over the white ball. It is now captive by just the string. Now pass the metal ring through the slit in the wooden peice. Finally again pass the metal ring over the white ball. The metal ring is released. ... but these are the type of operations you will need to free the ring. Not the answer you're looking for? Browse other questions tagged mechanical-puzzles puzzle-identification or ask your own question. Is there another name or site for this “Dominotion” puzzle?